This week’s Photo of the Week is very special. 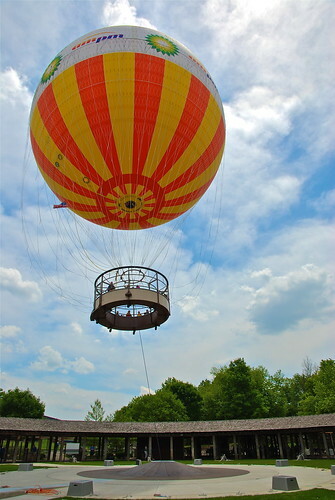 In addition to the fact that it’s a great photo of Conner Prairie’s brand new 1859 Balloon Voyage ride, it was also randomly selected from the pool of more than 1,700 photo submissions to My Indiana Summer to win a brand new digital camera! Warren Lynn of Indianapolis took this great photo and won a brand new Canon EOS Rebel XSi (a.k.a. 450D) SLR Digital Camera Kit (Black) with 18-55mm IS Lens & EF 75-300mm f/4-5.6 III Telephoto Zoom Lens + 8GB Deluxe Accessory Kit. Be sure to stay tuned to the Indiana Insider blog, as we’ll be posting the Top 5 photos submitted during the My Indiana Summer promotion on Monday. We want you to vote for your favorite photo, and the winner will be announced in August.